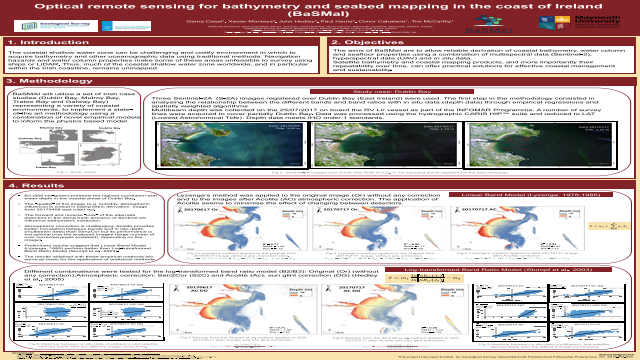 Abstract: The coastal shallow water zone can be a challenging and costly environment in which to acquire bathymetry and other oceanographic data using traditional survey methods. Navigation hazards and water column properties make some of these areas unfeasible to survey using ships or LiDAR. Thus, much of the coastal shallow water zone worldwide, and in particular within the Irish coastline, remains unmapped. The aims of BaSMaI are to allow reliable derivation of coastal bathymetry, water column and seafloor properties using a combination of multispectral data (Sentinel-2), hyperspectral data (UAV) and in situ data. The methodology will utilize a set of case studies, in a variety of coastal environments, to implement robust and novel research in Ireland in the fields of satellite image processing using empirical and physical modelling. Satellite bathymetry and coastal mapping products, and more importantly their repeatability over time, can offer practical solutions for a more effective management and sustainability of coastal environments and services. Summary: The aims of BaSMaI are to allow reliable derivation of coastal bathymetry, water column and seafloor properties using a combination of multispectral data (Sentinel-2), hyperspectral data (UAV) and in situ data. Satellite bathymetry and coastal mapping products, and more importantly their repeatability over time, can offer practical solutions for effective coastal management and sustainability.References: Lyzenga, D.R. (1978). Passive remote sensing techniques for mapping water depth and bottom features. Applied Optics, 17:379-383. Lyzenga, D.R. (1985). Shallow-water bathymetry using combined LiDAR and passive multispectral scanner data. International Journal of Remote Sensing , 6:115-125. Hedley, J.D., Harborne, A.R., Mumby, P.J. (2005). Simple and robust removal of sun glint for mapping shallow-water benthos. International Journal of Remote Sensing, 26(10): 2107-2112.